Horse racing contest players turned out Saturday, Sept. 2 to play for a cause – Hurricane Harvey relief. 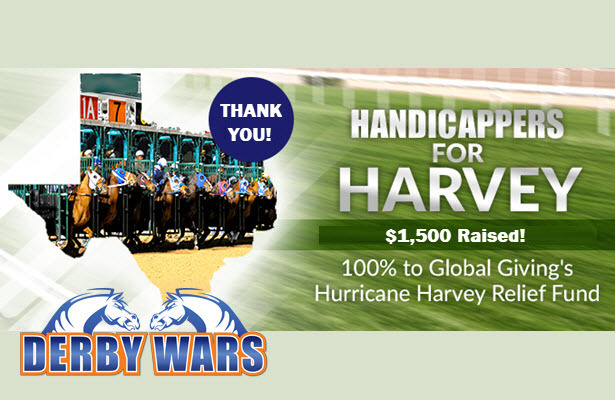 Handicappers for Harvey, hosted by DerbyWars.com, raised $1,500 through 127 entries for Global Giving’s Hurricane Harvey Relief fund. The idea came from Andrew Calvano (Stjohnshorsereport) and Bobby Shoemaker (2turnturfraces). The contest featured races from Saratoga’s final Saturday card, including the Woodward Stakes. 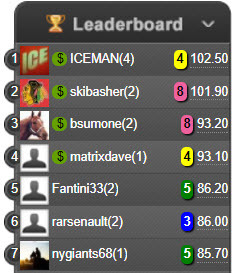 The winner was Dan Weisenburger (ICEMAN), who finished with a final score of $102.50. 2nd-place finisher, Garett Skiba (Skibasher), was only 60-cents behind with a score of $101.90. NHC Tour 2013 champ, Brent Sumja (Bsumone) finished in 3rd place, with Dave Vaccaro (Matrixdave) in 4th place, Ed Peters (Fantini33) in 5th, Ray Arsenault (Rarsenault) in 6th and Toby Simonda (Nygiants68) in 7th. The top 4 received small cash prizes, with 5th-7th place taking home gift packages donated by Calvano, Shoemaker and DerbyWars. Global Giving’s Hurricane Harvey Relief fund supports local efforts providing immediate needs like food, housing and medicine as well as cleanup and other recovery work. The 4-star rated charity has raised over $2.6 Million in just 14 days. 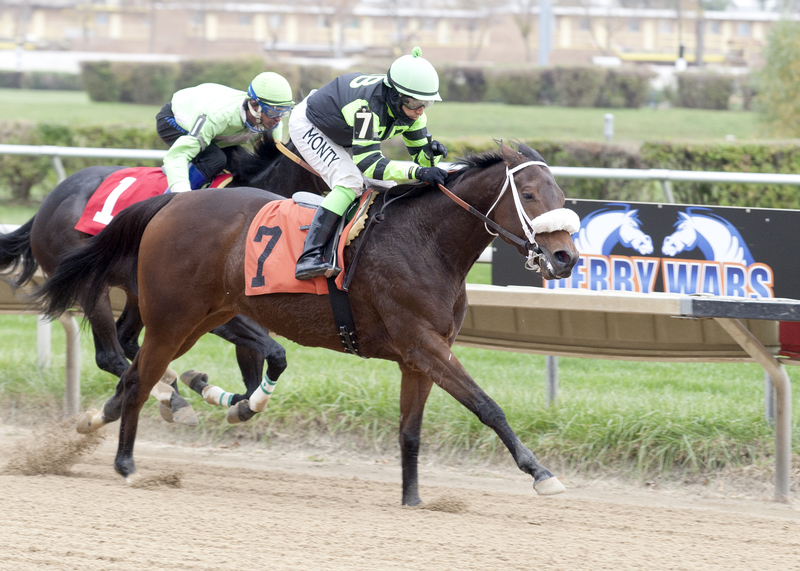 Louisville, KY – DerbyWars, horse racing’s leading contest site, is announcing new track partnerships which include NYRA, Monmouth Park, The Meadowlands, Ellis Park, Kentucky Downs, Louisiana Downs and Fairmount Park. The partnerships include revenue-sharing with the tracks and horsemen for use of their races in contests on DerbyWars.com, as well as video and data sharing opportunities to enhance the customer experience. These most recent partnerships join a list of other tracks with which Derby Wars has had previous revenue-sharing agreements including Hawthorne, Kentucky Downs, Cal-Expo and Sam Houston. DerbyWars hosts hundreds of Thoroughbred and Harness contests each week on DerbyWars.com. DerbyWars is a product of Horse Racing Labs, LLC, an industry innovation startup based in Louisville, KY which also includes HorseRacingNation.com, a leading horse racing news site with hundreds of thousands of profiles on horses, trainers, jockeys, stables and races and SuperScreener.com, which analyzes prominent stakes races each week so readers can wager more and with more confidence. For more information, contact support@derbywars.com. Columbus, OH — Both Hawthorne Race Course and Meadowlands Racetrack have announced partnerships with DerbyWars that include revenue-sharing with the tracks and horsemen for use of their races in contests on DerbyWars.com, as well as video and data sharing opportunities to enhance the customer experience. DerbyWars offers dozens of different harness contests each night featuring Hawthorne Thursday through Sunday and Meadowlands on Friday and Saturday. Games include Survivor contests, Head-Head contests and both free games and cash games. On Friday and Saturday nights, there is a $1,500 Harness Game with a $750 first-place prize. On Friday (July 14), DerbyWars will offer a free $500 contest featuring Meadowlands and Hawthorne races, which are also part of the USTA’s Strategic Wagering Program, starting at 9:30 p.m. (EDT) featuring Meadowlands races 7-10 and Hawthorne races 8-11. Fans can register for free at DerbyWars.com. To enter the contest, visit www.derbywars.com/tournaments/386380. Since those races comprise Pick-4 USTA Strategic Wagers at those two tracks, fans can get free past performances at handicapping.ustrotting.com. “Our mission is to be an innovator in horse racing and establishing partnerships with harness tracks will help us continue to introduce new players to racing, re-engage others, and ultimately grow the sport,” said DerbyWars CEO/Founder Mark Midland. DerbyWars, which has conducted contests on Cal Expo races since 2016, added Hawthorne harness races in mid-June. The new partnership between the Meadowlands and DerbyWars will also allow for the growth of the annual World Harness Handicapping Championship. “We are excited to join DerbyWars and think it is a great opportunity to get our world-class harness racing product in front of our core customers on the site as well as, hopefully, new horseplayers and potentially crossover players from the Thoroughbred world,” said Meadowlands GM/COO Jason M. Settlemoir. Easy-to-play contests and free games create a low barrier for new fans. Contests increase interest in day-to-day racing, not just big events. Social nature of contests leverages existing players to involve friends, re-engage dormant players, and congratulate winners. Technological advances such as real time picks, real time chat and social interaction create an educational environment where players can learn from others. 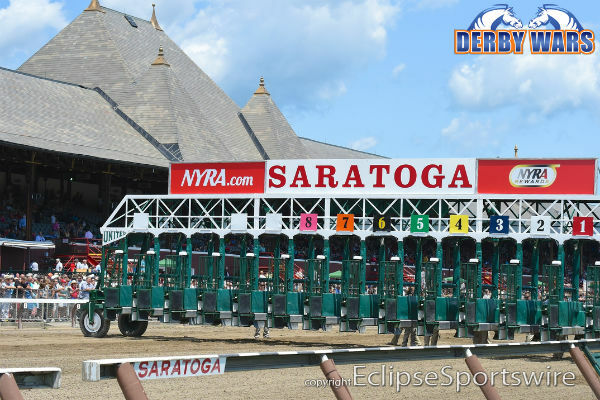 DerbyWars also announced new partnership agreements with several Thoroughbred tracks — NYRA (Aqueduct, Belmont, Saratoga), Monmouth Park, Ellis Park, Louisiana Downs and Fairmont Park. They have had previous agreements with Cal Expo, Hawthorne (Thoroughbred), Kentucky Downs and Sam Houston. DerbyWars hosts hundreds of Thoroughbred and Harness contests each week on DerbyWars.com. DerbyWars is a product of Horse Racing Labs, LLC, an industry innovation startup based in Louisville, Ky., which also includes HorseRacingNation.com, a leading horse racing news site with hundreds of thousands of profiles on horses, trainers, jockeys, stables and races and SuperScreener.com, which analyzes prominent stakes races each week so readers can wager more and with more confidence. For more information, contact support@derbywars.com.